Yes, it's biennial time -- which essentially preoccupies most of the critical energy allotted for the visual arts in Portland for the next two months. Regardless, group shows such as the biennial -- with its 20 artists -- are difficult to sustain. Those shows open dialog but leave definitive statements to the solo offerings. People expect too much from surveys. Thus, the private galleries offered the strongest shows in May. It's interesting to note that, in person, all three of this month's featured artists have a distinct physical presence. Even without the art, their personalities make one take notice. Maybe Greenberg was right, in that "personality" is necessary for truly first-rate work. Frankly, any postmodernist who thinks individuality is obsolete is kidding oneself. Individuality is the adaptive, problem-solving element in any culture. So, a bunch of narcissistic expressionists isn't invalid, it's just dull ... like talking to yourself. Luckily, there's no narcissism in these three shows. Tom Cramer, for example, has vowed publicly to shun prints because it seems disingenuous (anti-mass-production?). Sandy Roumagoux is fearless and witty in spades -- the kind of person most kids wish they could grow up to be. Lastly, Malia Jensen defines poise, a rare presence anywhere. These qualities are reflected in their work. Without personality and experience all you have is craftsmanship and résumés -- which adds up to professional mediocrity. Risk is necessary -- especially for abstraction -- and Tom Cramer is one of the few artists who seems to know this on a cellular level. This shows in his latest painted and metal-leafed woodcarvings. Two years ago, Cramer risked everything by changing his style. By making a mid-career shift from the diminishing returns of pop media overload to the challenge of spiritualism, he still embraces an inherent newness and a periodic shininess that keeps his art -- and consumer culture -- honest, valid and vital. Cramer recently visited Egypt, and a lesser artist would have copped the worn and ancient look of artifacts and antiques. But in Cramer's case, the latest painted woodcarvings look nearly newborn. He is no Ozymandius, and his Egyptian experience clearly sank in beyond aping surface treatments. Bravo. Youth is a most expensive aesthetic currency, and Cramer is generous where most other artists hold back. It suggests he isn't complacent. His painted woodcarvings are best when rough and physical -- a true heir to action painting (think Richard Pousette Dart) and Paul Klee's maxim of taking a line for a walk. 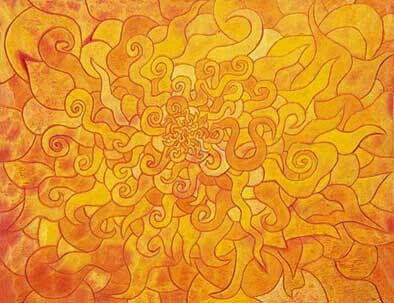 "Sun 2000," by Tom Cramer. 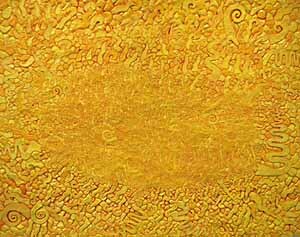 Works like "Sun 2000" have physical swagger and envelop the viewer with a multitude of similar, yet distinct, visual patterns. No social message is necessary; this is reflection and hedonism all in one. Luckily, Cramer's show is not some hackneyed discourse on Zen balance: here is a modern guy who wants the best of both worlds and sometimes gets it. In other cases he pulls back. An homage to filmmaker Stanley Kubrick's "2001" suffers from slickness. Other less-successful works try to bridge Cramer's earlier pop iconography of stars and hearts, but the risky dialog with his recent past is necessary for his progress. Abstraction is demanding because, compositionally, it is very easy to repeat oneself. "Velvet Voyage," by Tom Cramer. The less iconographic metal-leafed works offer a much better bridge to his past. Shiny is the new kiddy-pop-rave-culture in "Velvet Voyage." With this stunner, Cramer proves the impracticality of youth can exist as mature content. "Velvet Voyage" isn't just a mirror ball; it is a connection to the atavistic but structured group behavior found in modern raves and the potlatches of yore. Risky, newborn, rustic, mystic, ancient -- Cramer has addressed most of the things that, although constant in human history, have been passé for the last 30 years. History is on Cramer's side. "Reaching for Poodle in the Sea of Tranquility," by Sandy Roumagoux. Sandy Roumagoux is one of the most confident brush-handlers in the West and answers all but the most intractable nihilist as to why painting is still relevant. She has a way of making the absurd serious. 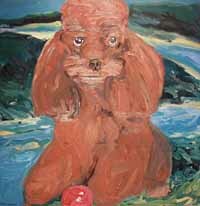 Her aims for this show were formal: to confound the traditions of landscape and portrait painting by making the central figure(s) -- typically, drooling dogs -- discordant and invasive to the scenic natural landscape backdrops. "South Beach," by Sandy Roumagoux. In other words, she has gone beyond both Edward Hopper and Oscar Kokoshka by pitting opposing aesthetics against one another. This would fail if it weren't for that wildly confident brush of hers. But it is why she's so good. 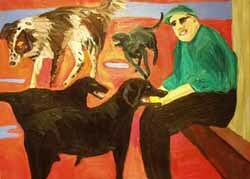 In a painting like "South Beach," the flying, palpably panting black labs literally radiate heat, capturing the thermal distortions that are just as quixotic as any ultra-minimal installation. The difference is that painting can only do this through gusto and skill. It invites scrutiny of the author's handwriting. Without this eritcreture we would have a declaration of independence signed by no one (and, therefore, not so rebellious). In this case, Roumagoux has thrown a Boston Tea Party -- which works in a way such that one ultimately ends up wondering if discernable authorship is even necessary for dissent. "The Muffy Overlook and the Yaquina Bay Estuary" says it all. 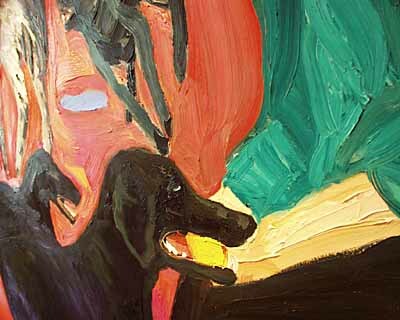 Roumagoux can paint the ultimate in kitsch and sociological rebus: a pet portrait that forces us to look at our attachment to the environment. It highlights that disturbing gray area of ownership of another living being and parallels our stewardship of the environment. "The Muffy Overlook and the Yaquina Bay Estuary," by Sandy Roumagoux. Where does stewardship begin and end, and when is it slavery? When is it silliness? When is something so ridiculous it must be serious? The only thing that can be said is that the sphinx-like confidence of Roumagoux makes the work all the more challenging. Sometimes authorship of the human hand calls all human activity into question in a way which newer mediums, such as video, would not be able to conscript nearly as well. Every media has its strength, and painting is good for reflecting on what we humans do. The brushstrokes are like a legal paper-trail implicating us -- for better or for worse. Malia Jensen's "Portraits" at PDX Gallery. In crowded public gatherings, Malia Jensen doesn't seem to breathe; she walks into a room and doesn't disturb a single molecule in the space. It's almost as if all her actions take place when everyone else blinks. She radiates respect. 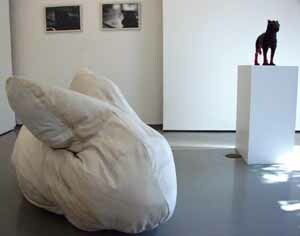 Her latest show at the PDX Gallery hit me the same way. 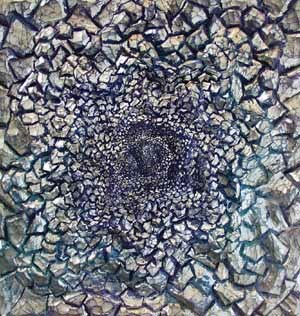 Her "Portraits" are diverse objects made of diverse materials. "Horse" is a cast-resin sculpture of an extinct primitive horse, with a color reminiscent of semitransparent cola or Dr Pepper. "Horse" seen at the right of "Bunny" doesn't draw attention to itself. The only words that come to mind are Res Ipsa Loquetur, Latin for "the thing stands for itself." Her "Horse" is a scion of independence and poise. This ancient animal came before any domestication. "Purse, Clutch Up" and "Purse, Snap," by Malia Jensen. 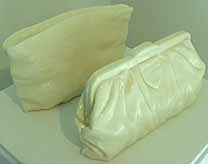 Her two purses (one with a clutch lip, the other with a snap) are made of soap, and what could be cleaner? 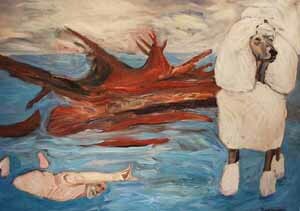 They evoke Louise Bourgeois, Claes Oldenberg and Kiki Smith, but seem to be of slipperier stuff than can be accounted for by art history. One could even attempt some virginal textuality and make a fool of oneself. But that is probably the point; it is private. Every year, more artists (ugh -- Tracy Emin et. al.) try to evoke privacy with a bed (can we have a moratorium on hackneyed beds, please?). But Jensen picks a better medium and richer object with her purses. 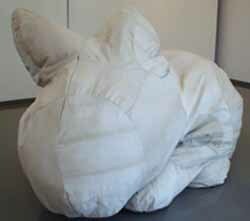 The centerpiece of her show is "Bunny," a white, bear-sized beanbag rabbit of canvas and leather. Why canvas and leather? Some fetish for Chuck Tanner hightops? There is no obvious answer, but the floppy ears and bag-of-laundry body puts one into a strange, protective, fatherly mode. In fact, many of Jensen's materials have a delicate quality, highlighting the reality that preservation is an integral part of what is considered art. It's doubtful that the unknown carver of "The Venus of Wellendorf" considered it an unusual masterpiece worthy of icondom. Yet, it has survived so it is an ICON. In this latest show, Jensen's titles are more opaque than the big show last year at Portland's PICA, which depended on wordplay. Still, Jensen continues to sweat the details and the result is even more explicit and condensed. Like Beuys, she is building a personal iconography of materials: soap, resin, horsehair and photography. One gets the sense that she juxtaposes materials in order to highlight the atavistic, basic elements that we would otherwise take for granted. In a world where we rarely see the chicken lay the egg, we are often left wondering which came first. For this show, the questions are the only explicit entities. All three shows speak very well of Portland. It is obvious that the Rose City has a kind of "Land That Time Forgot" aspect in relation to modernism. I know, I know: that old dinosaur again. But lets face it: if you saw a Triceratops, it would make your weekend. We're not talking about real modernism where there is a constant belief in "progress." We know better. Instead, it has regained a faith in human endeavors but goes beyond postmodernism shorthand for complex issues. Postmodernism is too nihilistic, and for the most part humans are driven by hope. In these three shows content still matters (Roumagoux), hard work and spirituality are not dead (Cramer) and in the end we can have the deconstruction and fractured multiplicity of postmodernism (Malia Jensen's work). Still, even in that context, Jensen's work is truly personal, and supports a very modernist cult of the individual. Heck, the show is called "Portraits." Post-postmodernism is simply a lazy, stupid term. Something akin to hyper- or extended-awareness is headed toward the ballpark -- but still inadequate. I propose that all three shows deal with complexity outright (Cramer has fractals and Roumagoux and Jensen have adopted a meaningful form of absurdity) and are more or less trying to engage monstrously large issues or systems. Issues that, through computer modeling, data-mining, etc., we have suddenly been able to engage in detail and not in euphemistic shorthand of: "*target* white, balding male 35-42 moderately affluent, probably owns a Honda." We now know his details: he has a three-year-old dog named Boo and never plays golf on Tuesdays. He reads art criticism in nwscuttle.com -- staying on Jeff Jahn's page for an average of 12.62 minutes per visit.